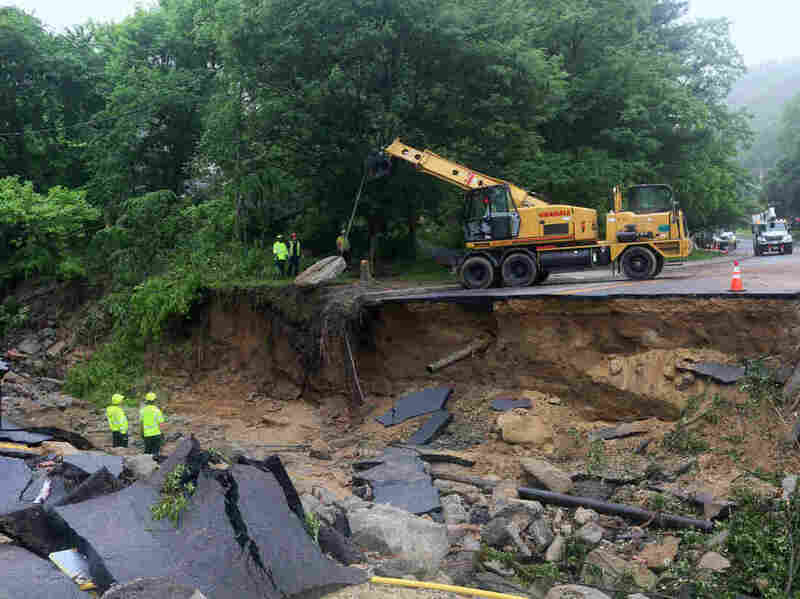 More Rain, More Development Spell Disaster For Some U.S. Cities Climate change is increasing the frequency of rainstorms in many parts of the U.S., and those storms bring more rain. Many communities don't have the drainage systems needed to handle all the water. Debris and cars clog the Patapsco River in Ellicott City, Md., after flooding on May 27 that killed one person and destroyed much of the town's Main Street. That downtown was largely destroyed by a flash flood in 2016. Main street was a raging river, tearing off awnings and sweeping away cars and dumpsters. Two people died. It took millions of dollars and more than a year of work to rebuild. Then, on Memorial Day weekend this year, just as many businesses were reopening, the same thing happened. A thunderstorm dropped about 8 inches of rain in three hours, the road became a river, and a man was killed. "This is our new normal," says Kevin Bloom, whose family has owned West End Service, a local commercial truck dealership, since the 1920s. He's standing in front of a boxy garage, looking across the parking lot that should be full of vehicles waiting to be sold or fixed. Until recently, Bloom cleared out the parking lot only in special situations — like when the remnants of a hurricane made their way up the coast. Now, the almost-daily thunderstorm warnings in this area make him nervous. "Any time there's a threat of a storm, we move things out of the way. That's how we have to operate," he explains, pointing up the hill where he parked his inventory. "We have real estate that we can't use [during] certain times of year, because there's always a threat of a storm. And it's not a tropical storm, it's a thunderstorm." A road that washed out in Ellicott City, Md., during the second catastrophic flash flood to hit the city in two years. 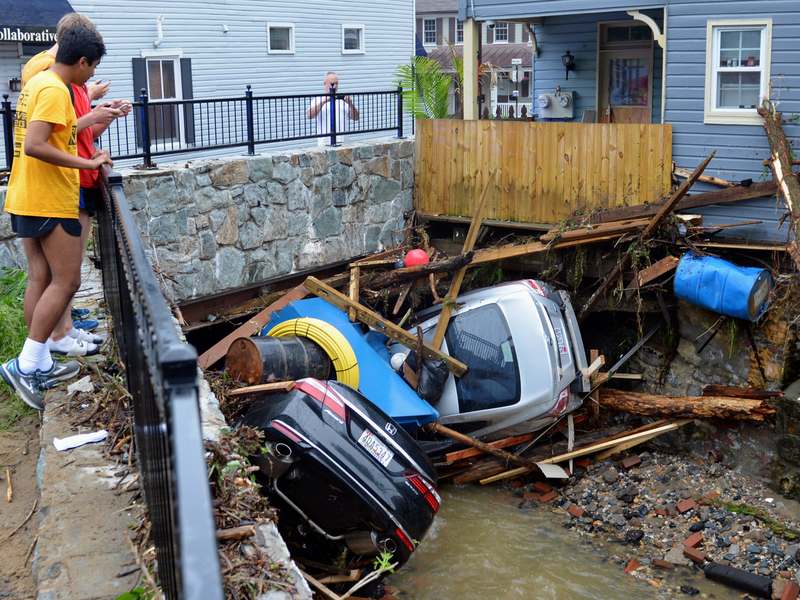 Scientists say there are two reasons for flash floods like the ones that have hit Ellicott City: more rain, and nothing to soak up the water. "As we increase the greenhouse gas concentration, the Earth is heating. The air warms up, the oceans warm up, and more water vapor goes into the atmosphere," explains Donald Boesch, the former director of the University of Maryland Center for Environmental Science. "And, if we can remember from fourth grade, [the] water cycle — whatever goes up has to come down." Warmer air and water have led to more precipitation in some parts of the United States. "It's a matter of both frequency and the amount of rain that comes in these extreme events," Boesch says. "For the Northeast, about 53 percent more rain is falling in these extreme rainfall events." According to the 2014 National Climate Assessment, the Northeast and Midwest are seeing the largest increases in heavy rain. Even in the Southwestern U.S., the amount of rain that falls during severe storms is increasing, even as climate change also increases drought risk. All that rain has fewer and fewer places to go. "We have altered the watershed so that the water runs off more rapidly," Boesch says. Parking lots, roads and roofs make the ground less permeable. For every new parking lot or wider road, communities should also expand drainage systems such as stormwater retention ponds and larger storm drains. But many places, big and small, haven't kept up with both development and climate change. For example, Houston is scrambling to expand reservoirs and reinforce bayous after Hurricane Harvey overwhelmed the city's drainage systems with more than 50 inches of rain last year. On a smaller scale, something similar is playing out in places such as Ellicott City. "Merchants and property owners are the ones who pay the price," for the increased flood risk, says Ron Peters, an Ellicott City resident and member of a local flood control working group. Peters says the state and federal governments should help the county upgrade its drainage infrastructure upstream of Ellicott City. "I've walked the watershed, I've driven through it hundreds of times. That's where the problem is," he says. "We need to build retention ponds, and we need to make the existing ponds bigger." Bloom, the auto dealer, says drainage infrastructure does need to be updated, but that with more rain coming more frequently, some buildings may need to be removed. "The approach needs to change," he says. In the future, "some homes may not be where they currently are, because they need to give it back to the stream." That might include the home where his grandmother was born. In 2016, the house was badly damaged by the floodwater. They rebuild and added sealing doors and other protections, but it made little difference — last week's storm damaged the foundation and left the the home unlivable again. It's becoming clearer and clearer to him that, if the floods are here to stay, the house may have to go.